A gloriously illustrated celebration of men who have changed the world with their kindness and compassion. What if we celebrated men for their kindness as well their strength? For their generosity as well as their career success? For their loyal friendship as well as their charisma? 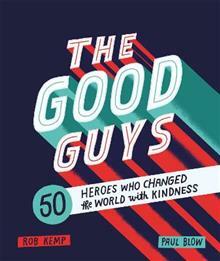 Man Kind introduces us to fifty men who have showed that changing the world doesn't require a sword or a corporate jet. Readers will find stories of extraordinary men including David Attenborough, Nelson Mandela, Oskar Schindler and Professor Green, as well as unsung heroes such as James Harrison, who has spent 50 years donating his rare blood to save millions of babies. Man Kind celebrates the feats of heroes and everyday men, and will inspire readers to transform the world through compassion, friendship and understanding. Rob Kemp (Author) Rob Kemp is a UK-based writer specialising in fatherhood and masculinity. Contributing to Men's Health, Father's Quarterly and the Times Educational Supplement, he is also the bestselling author of The Expectant Dad's Survival Guide and The New Dad's Survival Guide. Paul Blow (Illustrator) Paul Blow is an illustrator based in Dorset, UK, with a distinctive style reminiscent of comic books, gig posters and album artwork. Other clients include the Guardian, the Independent, VH1 and Byron.